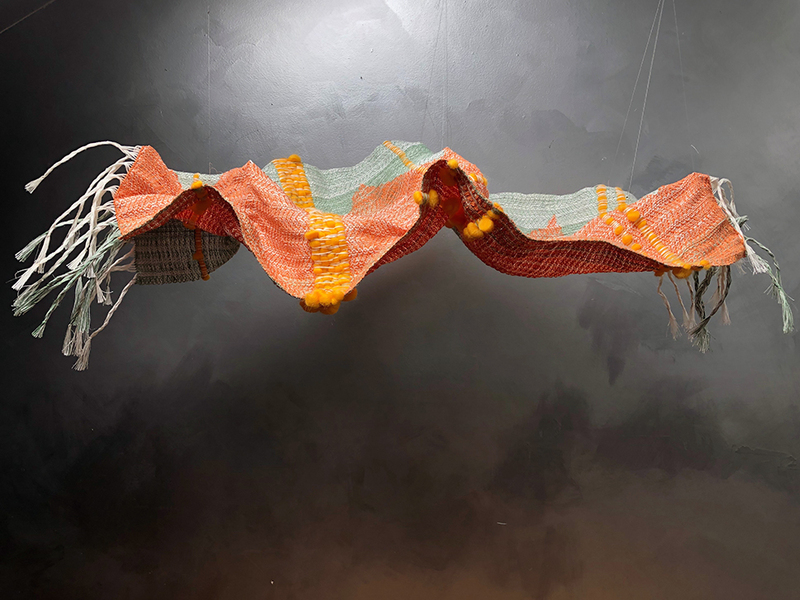 Lis de Vries is a textile artist based in Melbourne, studying at the School of Fashion and Textiles at RMIT. Growing up in Hobart, Tasmania she was surrounded by the craft traditions of my migrant family and inspired by living amongst nature, the bush and the ocean. Lis creates textile pieces using techniques such as weaving and embellishment that are bold and make a statement. Seascape is a textile piece that encapsulates the movement of the sea. The piece is woven on an 8-shaft Jack Loom with an undulating twill design. It comprises linen, mercerised cotton and wool tops in hues of cream, green and orange. The piece incorporates wire on selected warp threads to create form producing a wavy undulating shape. The design of the piece is reminiscent of a tidal pattern.